March 2015 – Why Knot Friar? Narcissus was a handsome hunter who knew he was handsome and would show disdain for people who recognized him. He was proud and haughty, if you loved him then he responded with nothing but dislike for you. Narcissus was enticed by Nemesis, the goddess of revenge, to gaze into the pool’s reflection, whereby he fell in love with his own reflection. Nemesis was seeking revenge for jilted Echo, a beautiful goddess who was despised and rejected at every turn. 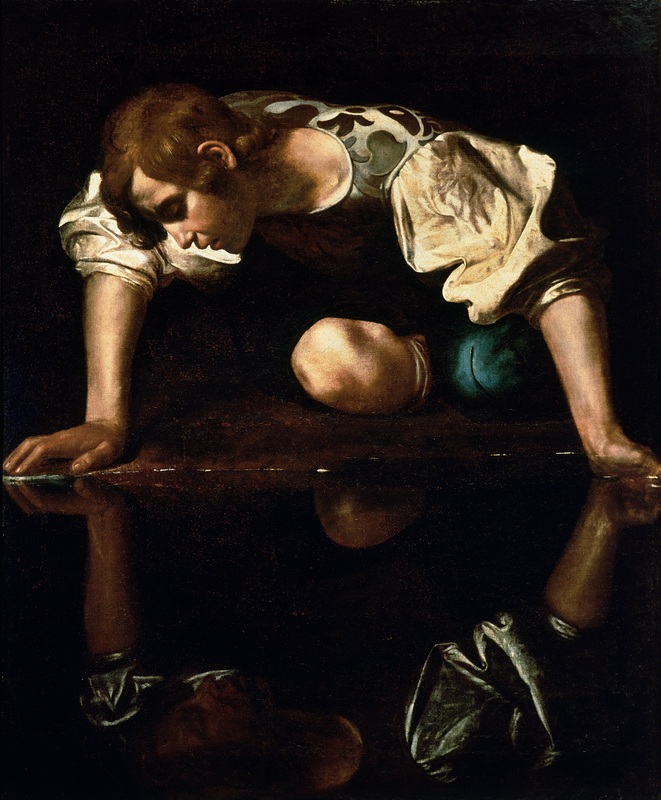 Narcissus could not take his eyes off himself, leaning closer and closer toward his own reflection, he fell into the water and drowned. Narcissism means to have an unhealthy fixation with oneself. What are the things that captivate you and fixate your attention? In March I enjoyed a homily by Bishop Jospeh Cistone of Saginaw, MI who uncovered the narcissistic tendencies of our culture to fixate on individualism and the popular philosophy to “go it alone.” One example is the tragic story of Chris McCandless a 24 year-old who broke ties with family, friends, and society to survive solo in the wilds of Alaska with no safety net. Jon Krakauer wrote a book about his adventures called “Into the Wild” that details his journey from the Ivy league to Denali National Park. McCandless did himself in with his narcissistic myopia when he ate wild potato potato seeds that later caused paralysis and the inability to save himself. I listened to Bishop Cistone speak about the chronic levels of narcissistic individualism that paralyze our own culture. We have a strong chord of individualism that pushes the human person toward selfish pursuits rather than seek out community support. I watched a couple venture out to dinner who were sitting with 2 laptops, 2 cell phones, and completely disengaged from each other across the table. We have so much screen to screen communication these days that our person to person communication is deprived of minimal human interaction. We now have resources available to answer every question on the internet that only requires a pocket sized gadget. People delight in their own information overload as we send voice commands to Siri rather than approach a living person. We love to post social media alerts about our doings and updates, “its all about me” right? It is more convenient to pull up Global Positioning by Satellite rather than ask a person for driving directions. Individualism is a part of the every day person engaged in technology. We are so wired to narcissistic media that is is near impossible to unplug. What do you think about my selfie now? Are these technological marvels fixating our attention on Nemesis’ entrapping pool? How do we depart from the pool edge of this beautiful reflection of what the self can do? A person’s vocation is the polar opposite of narcissism. A vocation will pursue the area in life that a person can make a generous gift of self. It is a call from God that will enflame one’s desire to serve others. St Clare says her entire life is a call “to become a vessel of God’s compassionate love” poured out for others. This call will never survive in a private world of “God and me.” It requires the community to confirm and affirm the call. The community will sustain a vocational call whether the state of life is a call to be single, ordained, married, or religious. A vocation will have a person compelled to serve a part of the world much bigger than the self. A vocation is not a career but is a personal call by God to serve. Individualism will never survive in a selfless sea of God-called swimmers. There is an imprint of God in the soul of each person to give themselves generously to a vocation. Given the opportunity people will selflessly give of themselves to something bigger than themselves. We are hard-wired to give ourselves away to a vocation. During 9/11 when the twin towers of the World Trade Center were taken out by terrorists, EMS providers were rushing toward the scene. When most people were fleeing the scene for their own personal safety, fireman, policeman, and EMS providers were running toward the chaos. Some ran for their lives away, others ran for their lives toward. 343 firefighters and 60 policemen died on that day under the rubble of the twin towers. One could easily imagine the difficulty to recruit EMS providers in the aftermath of that level of destruction. But the opposite occurred. Recruitment levels are at record levels in NewYork and people desire to put their lives on the line selflessly to give themselves to something bigger than themselves. These individuals have found their vocation and seek this with all of their heart. This type of self donation has no space for Narcissus. Where is God calling you to make a heroic donation of self? Have you asked yourself, where does God want my gifts to be selflessly given away in His service? This is your vocation swim practice. And today’s swim lesson is to pull you away from that dangerous pool of narcissism. God is our lifeguard and He will not let us drown!